The PLATE setting provides a shimmering smooth wash of space that’s a go-to choice from the studio recording world. 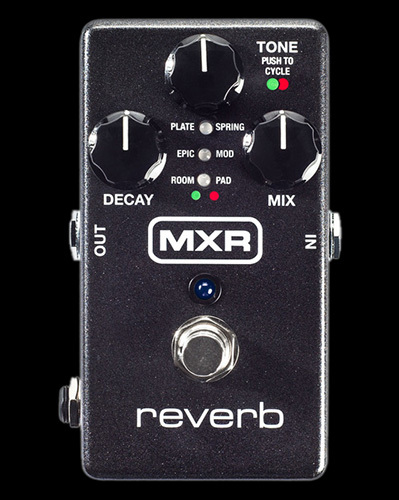 SPRING sets a new standard for truly authentic sounding reverb without coiled metal—a perfect recreation of the classic amp-based effect, with the Tone control taking you from dark vintage amp spring, through classic jangle, to bright surfy splatter. EPIC is a unique combination of multiple interwoven analog-tone delay lines and complex modulation—perfect for solos from that more shaded part of the lunar landscape. MOD throws down a plate-flavored spaciousness with richly organic modulation in the feedback path. The ROOM style adds subtle body and projection to your guitar tone at shorter decay times while longer decay times yield rich organic space that doesn’t wash out. PAD closes out the line-up with a unique combination of sub-octave + octave-up with echoes + "shimmer" + synth/organ modulation + reverb.